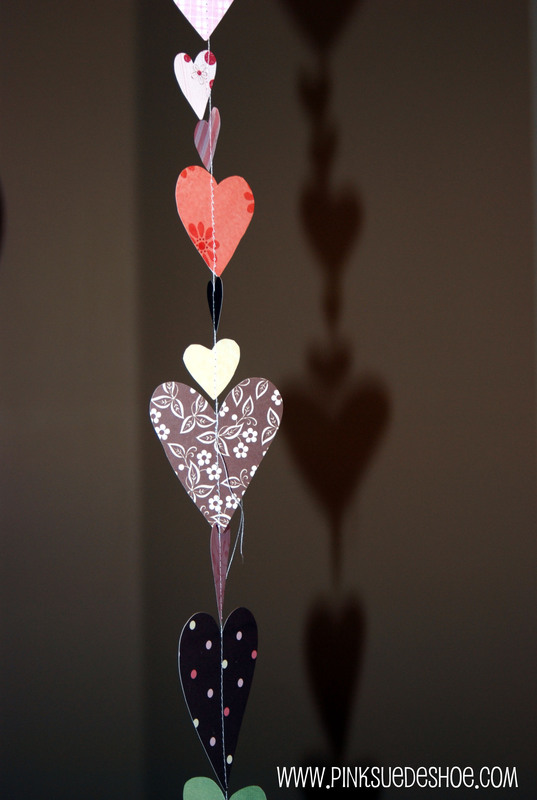 Last week I saw this felt heart garland over on Made By Rae. I don’t have much felt in my stash, and it’s on the do not buy list for my craft supply resolution. But I do have a very large paper scrap box, and out it came! Some of the paper in this garland is from projects that I finished more than 15 years ago, in my first junior high days of scrapbooking. I kind of like having it in here! 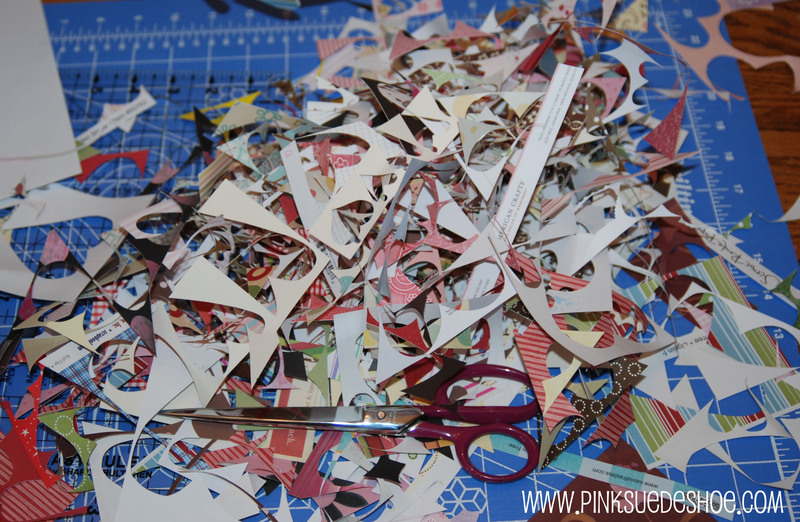 Out came the scraps, and the scissors, and I cut and cut and cut. And cut. And I have the scrap pile to prove it. And the sore scissor hand. I sorted them into smallish, mediumish and largeish and started sewing them together, not really sure how it was going to turn out. So, now my biggest question is, where do you put 76 feet of paper heart garland? I am adding this to the Sew&Tell over at Amy’s. I figure anything that requires 4 hours of cutting, and a whole spool of bobbin thread counts. Go look at the other projects, they are amazing. As always. oh WOW!!! That looks fantastic! Actually, I was thinking that it would go even faster with paper, so I’m so glad you gave that a try. I love how that turned out; thanks for sharing!!! Wow I love those! Your hand must have hurt after you were done cutting! The colors are great! Oh my, this is soooo pretty! I love it the way it is right now, on your chandelier! It makes me smile! So pretty. I would rather it rain hearts than water. Wow. 76 feet? You could wrap that around a room a couple times! I love the idea to do it with paper. I saw that in Rae’s blog and really liked it to, i just didn’t know what I would do with it. I also like that it holds sentimental value! and thanks for following my blog! I will return the favor! The effort was worth it. It looks soo good. Very pretty! That’s a great way to display it. I agree – if it takes longer than 30 minutes it qualifies as a project! That is really cute! Another great tutorial. Thanks for sharing! Wow! 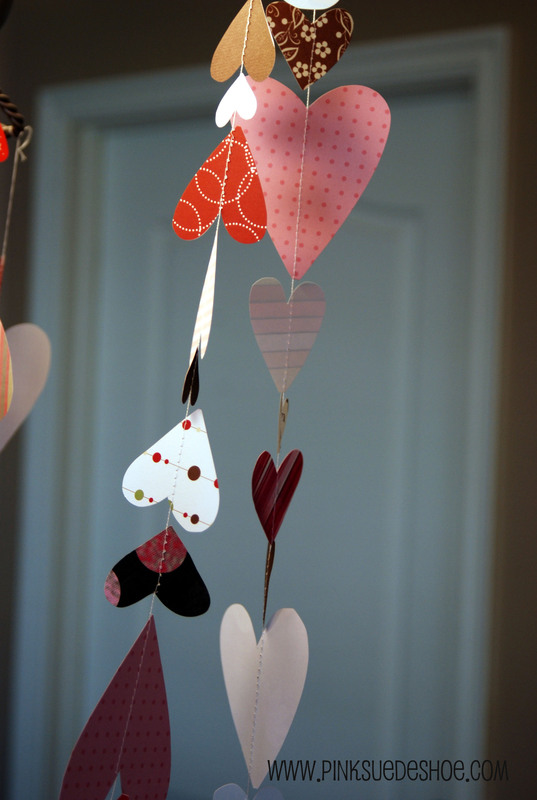 Love your garland, so pretty and a great way to use up paper scraps. It’s the coolest garland I have ever seen! Have you regained the feeling in your scissors hand yet? LOVE THIS! So cute. I love the variety of prints paper can offer rather than felt.